There are some various breakout zones ahead for many altcoins, bullish and bearish. Even though the broader market continues to consolidate, but altcoins are showing some evidence of leading a move higher. I personally like NANO – as a transactional cryptocurrency. It’s about as near instant as you can get and the fees are pretty close to 0. So it boggles my mind that this crypto is not valued higher than what it is. A good amount of the reason could be related to some legal issues regarding some of NANO core team members and the defunct exchange Cryptograil. That news has clearly not shown to affect the price of NANO as it has not budged or moved any different than the broader market. From a trading perspective, NANO is sitting right below its 0/8th Major Harmonic, which is the final support level for NANO before total price capitulation. But its held within that value area and has traded in an extremely tight range ever since November 15th. Because we have broken above the key 0/8th Major Harmonic at 0.0002621 but fail to hold, I am waiting for a close above that level and closer to the 0.0002938. For 0x, the current arc is acting as a source of some stiff resistance, so plotting any long trade requires some patience. 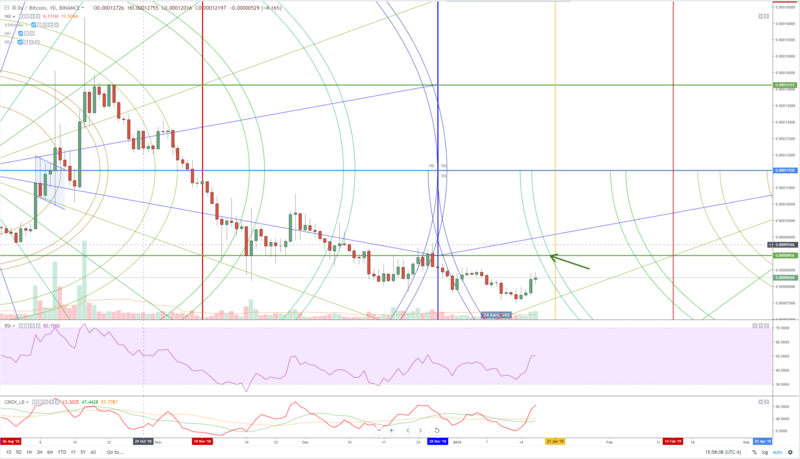 I am only looking to go long with ZRXBTC if when we move beyond that arc in time, but also when we cross above the 3/8th inner harmonic at 0.00008936. There continue to be some strong fundamental reasons for why I like this cryptocurrency. The ability and idea to use blockchain technology to tokenize ownership of digital ‘assets’ is something that will catch on very soon in the gaming industry. 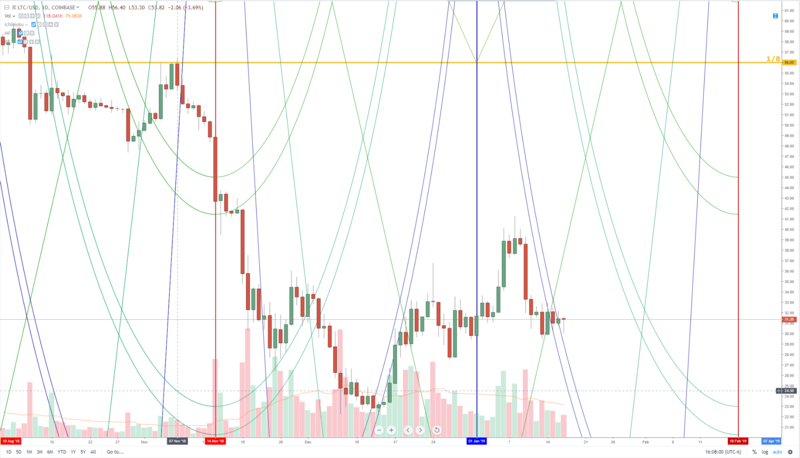 Litecoin led a very strong and healthy rally from December 14th to January 8th, rallying a nice +86.15% before facing a pullback. The resistance it faced was the outer arc and a pull to the 45-degree angle – which is directly where it traveled to and stayed. Today is the first day that Litecoin has traded away from that arc and is now totally outside of it. There was a good amount of selling pressure during the day, but that has been bought back. It’s currently trading very near the open of the day. I am actually comfortable taking a long position here because the ’45-degree angle’ is actually quite steep and every day it moves a significant amount of price higher. In this style of market geometry, the acts as a sort of ‘magnet’ – it represents equilibrium in time and price, so price naturally wants to be trading near that angle. The further it moves from it, the more violent the move back to that angle.